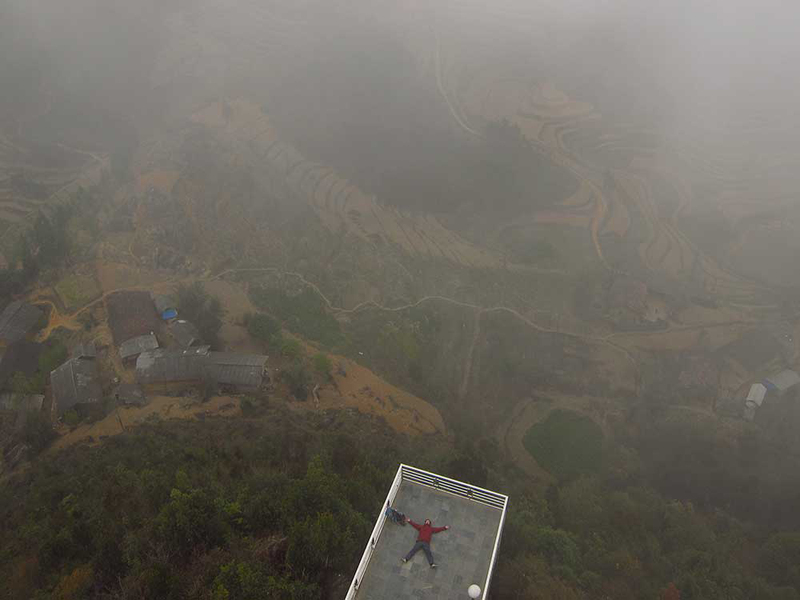 After leaving our short-term job in Sapa we, like a greased pig on a slip-n-slide, relentlessly and unstoppably rolled forwards, occasionally panicking, hoping that we’d slow down before hitting a wall. Our plan to travel the length of Vietnam’s north, looping around the Chinese border through the north-east and then down to Halong Bay before about-turning back to the chaos of Hanoi, was ambitious for the three weeks we had remaining. But we wanted it all. We were greedy. 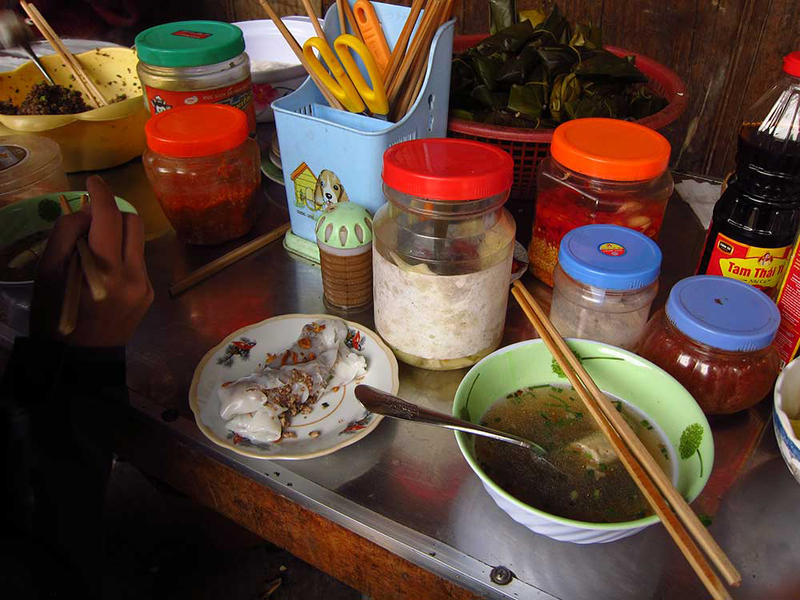 Many of the towns in the north of Vietnam have culinary specialties and Hà Giang city is no exception. There is a root that, much like a puffer fish, is poisonous unless prepared by a skilled hand. We sought out the dish that contains this root – cháo ấu tẩu. 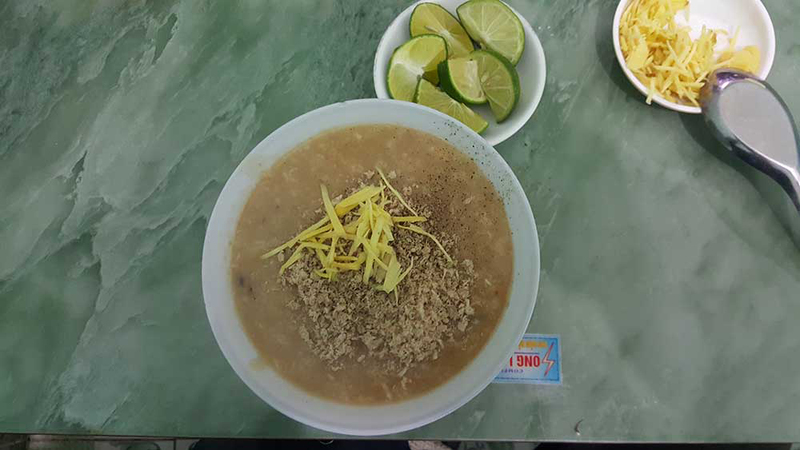 It’s served as a flavoursome rice porridge with a slightly bitter aftertaste. As we ate, a 22-year-old man approached us with his younger brother. “Can we sit here?” he asked. Of course, we said. 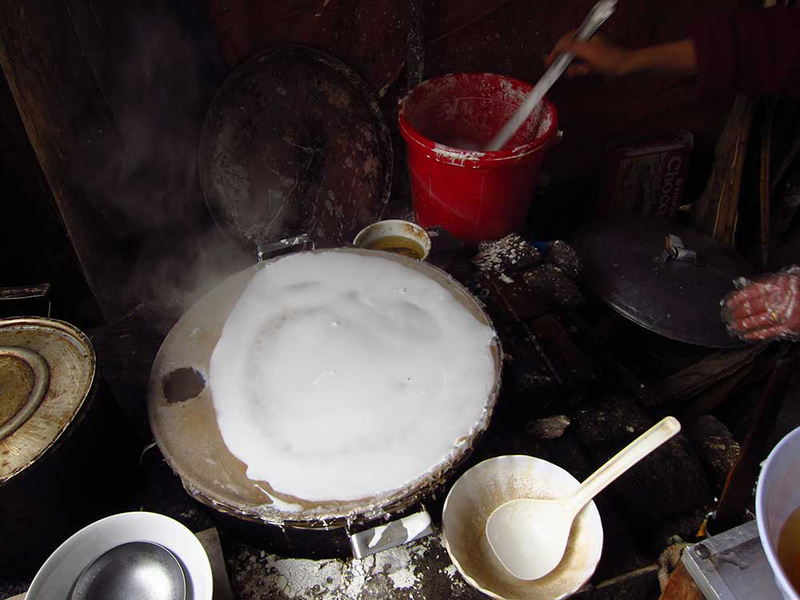 He dropped down his bowl of bánh cuốn and began chatting away in English. “I’ve been trying to get a scholarship to get my masters in either the UK, Australia, or New Zealand,” he told us. He had recently gotten a job out of law school working as a secretary for a public prosecutor. We asked if he’d learned in school, and he said not really – they teach a little bit of grammar but that doesn’t help with conversation. He said that none of his friends and nobody he knew could speak English, yet here he was chatting away fluently to us. He seemed very well practiced, and he was trying to now teach his younger brother how to speak. The young kid was nice, but he seemed more interested in sniping and exploding people with grenades on his phone. “Do many western tourists come through this town?” Caroline asked. 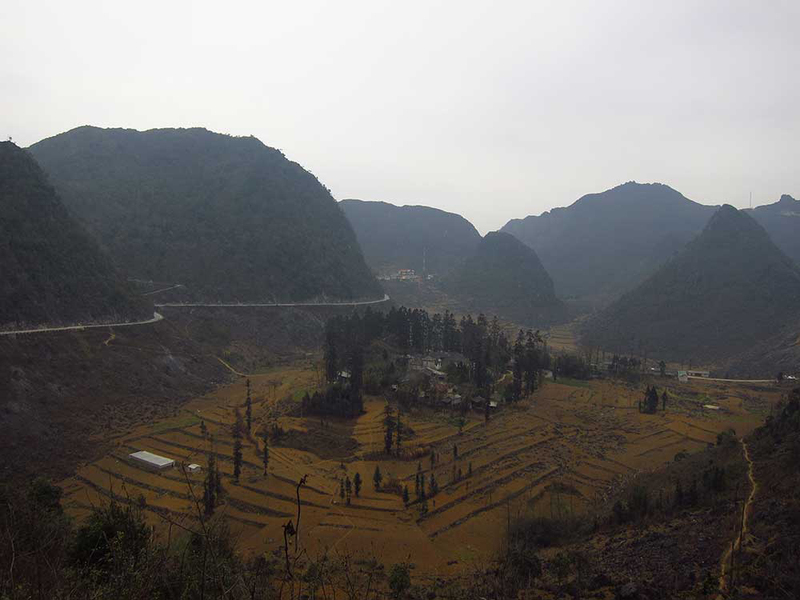 Officially you are required to secure a permit in order to visit the Hà Giang province, but during our trip nobody asked us to produce one. We paid 210,000 dong each for our permits at the customs office in Hà Giang city, which was cheaper that getting them through a guesthouse but more expensive than not getting them at all – evidently a valid option. 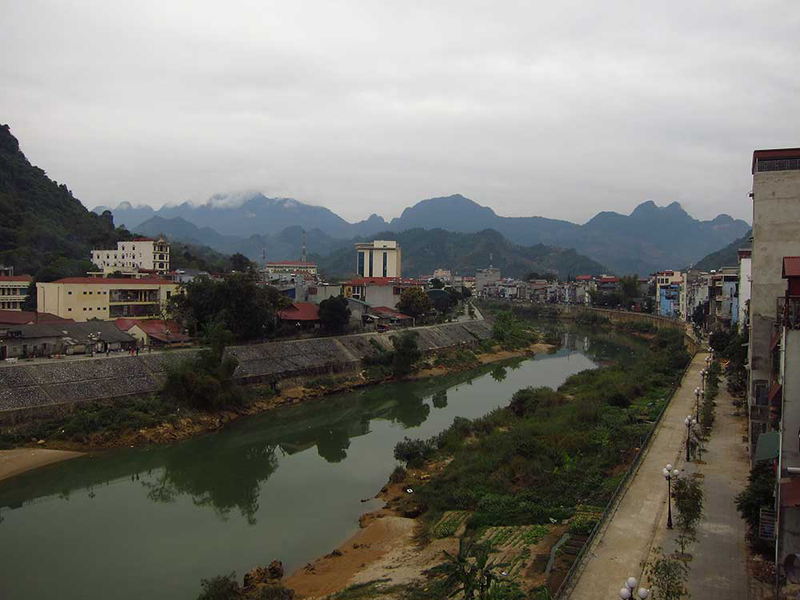 We spent the following night in the town of Quản Bạ, which seemed to be famous from a distance but not so much up close. 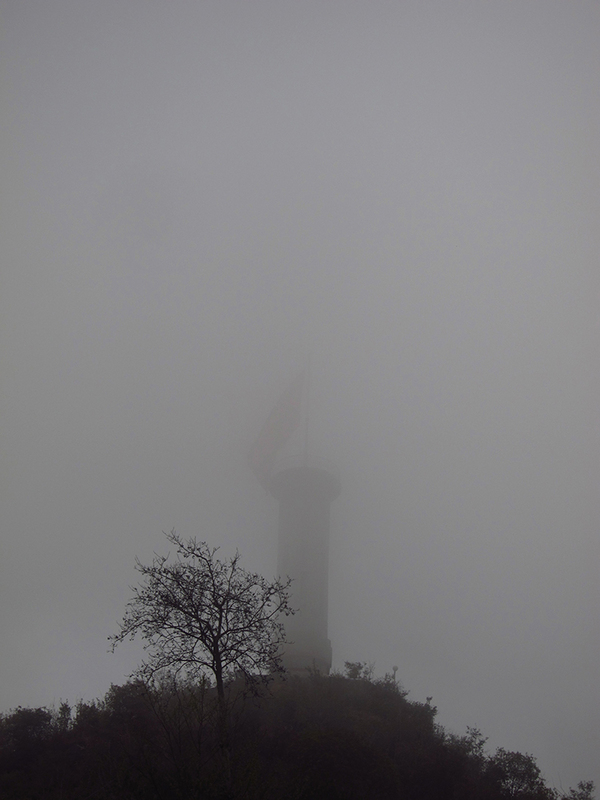 The road towards the town descended from above revealing a lookout post in the Chinese pagoda style. 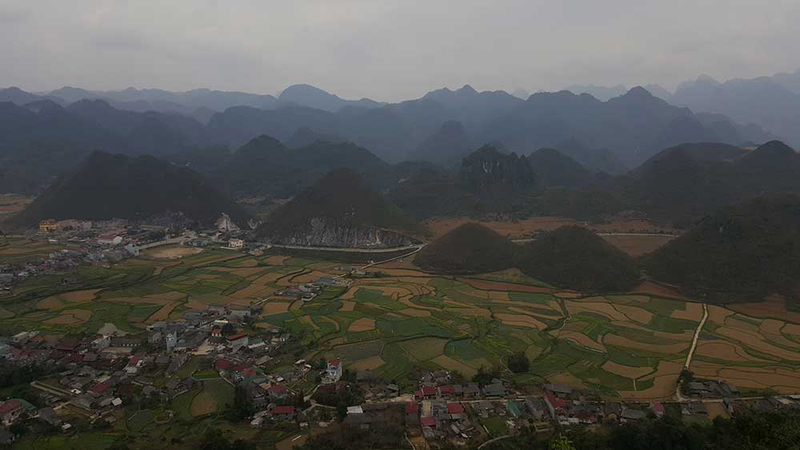 Quản Bạ was set in a valley dotted with conical limestone lumps, and was amply endowed with a pair of round hills called ‘Fairy Bosoms’. A close inspection of the bosoms proved them to be smaller than first imagined with a scruffy growth of shrubs. The main street was mostly empty, but for dinner we found a rotund man hidden away in a windowless wooden shack cooking chicken phở. The phở was good, but I don’t remember the finer details of the restaurant, instead choosing to focus my attention on attempting to woo a terrified cat (unsuccessfully). We were the only customers. There they are. The Fairy Bosoms. On the road to Dong Van. 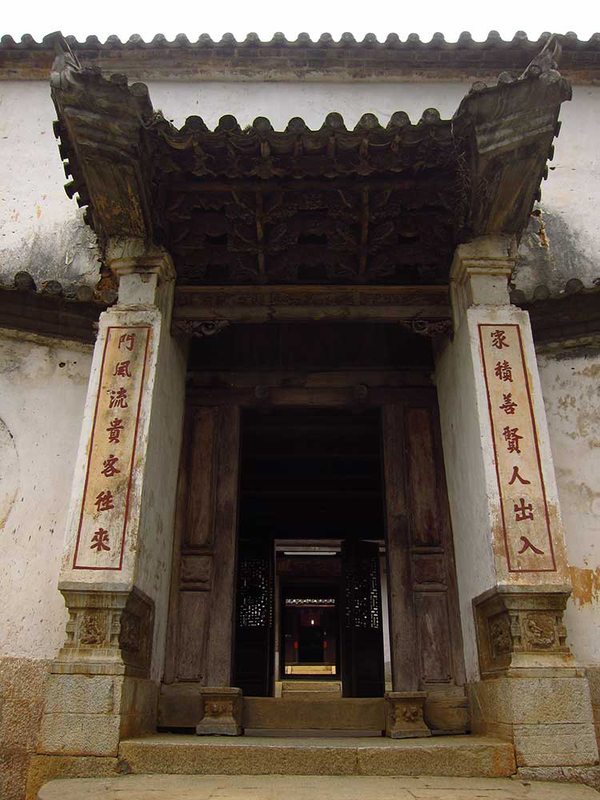 The entrance to the king’s house. The next stop was Dong Van where we slept in the unnamed home stay of a very enthusiastic man and his wife and two children. The evening consisted of sitting in his lounge watching the news in Vietnamese, drinking more tea than I think I’ve ever had in one sitting in my life, and sharing a meal while trying to communicate through Google Translate. 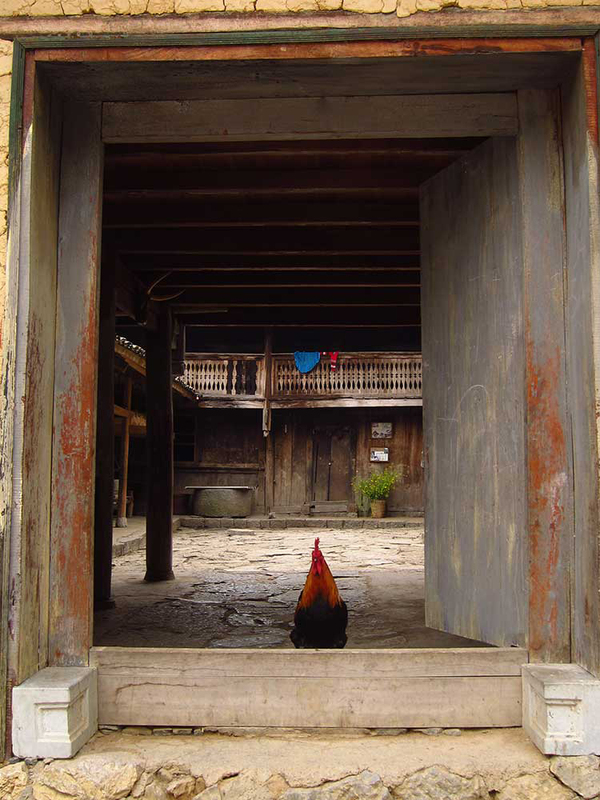 His house was one of the earthen mud huts of Dong Van’s old town and sat at the base of the surrounding cliff face. I’m not sure if he laced his own tea with booze of if he went off to the kitchen to sneak a few shots, but as the faint smell of rice wine grew stronger his arms flailed more and he began grabbing my knees a lot. Eventually he invited us to his attic to drink home-brewed wine, but the thought of the following day’s drive and a fondness for our eyesight forced us to decline. Minutes after we closed our bedroom door for the evening, he burst in and tried to force a nightlight into a stubborn plug. When it refused to allow him access, he tried forcing it into another one until we intervened and convinced him that we didn’t particularly need or want a nightlight. At about 6 a.m. the next morning somebody tried to enter our room again, but we’d locked the door. After that, I lay awake listening to the cries of the man chickens, the yelling of the kids, and the nattering of people passing by. Vietnam rises early. Caroline continued sleeping. Breakfast was bánh cuốn; rice batter spread like a crepe over a taut cheesecloth, steamed, then rolled up with minced meat or mushrooms. It is served with a pork broth containing spring onions and sausages. Condiments like chilli, pickle, or vinegar are there for the taking, and if you’re lucky you’ll get fried shallots on top. You can ask for ‘trung’ (egg) and they’ll either cook one into a rice roll or lightly poach it in the broth. It all depends on which stall you’re at. A man who’d been eating with us ducked into the house – for it was the porch of a house where this breakfast was happening – and returned with a bag a lollies and a couple of ‘Choco-Pies’ for our travels. The sentiment was lovely, even if ‘Choco-Pies’ taste like cardboard filled with sand, and we were very thankful. Breakfast was half the price it would normally be for the same meal elsewhere. North of Dong Van, north of everything in fact, sits Vietnam’s North Pole. 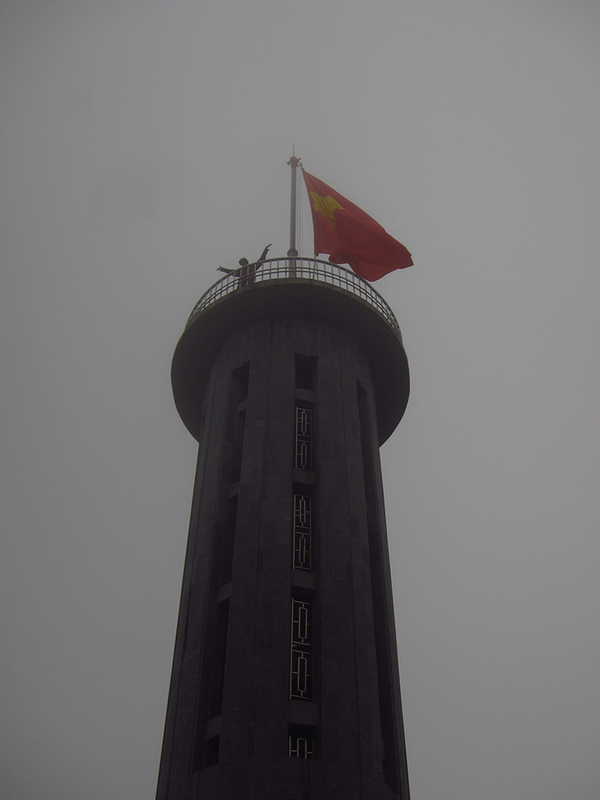 Situated on the highest hill in Lũng Cú, the pole looks out over – oddly enough – one of the most southern edges of China. An Australian group on an 8-day motorcycle tour were at the pole. I asked one of them, jokingly, how the view was. 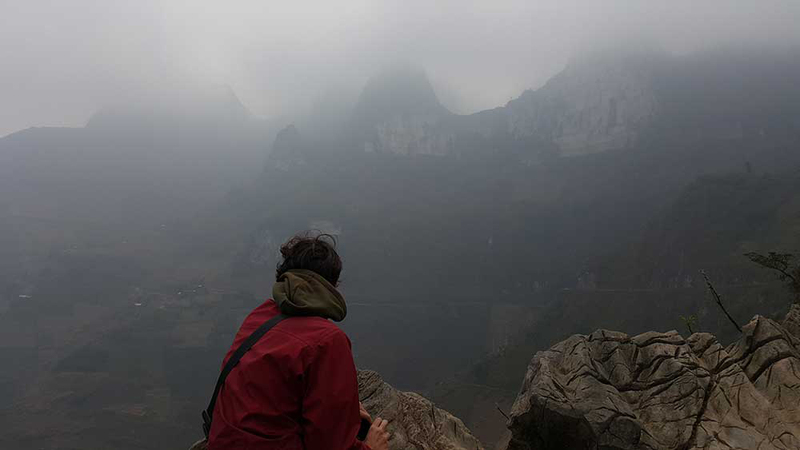 We had arrived in a thick fog which blanketed the area. “Can’t see anything, mate, we just took some selfies, y’know?” he grinned. Visibility got a little better up close. 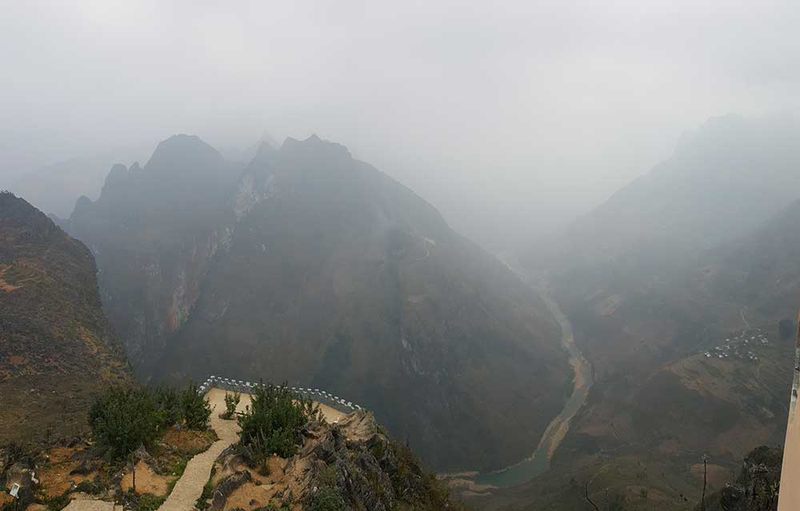 The most striking views we witnessed in Ha Giang were between Dong Van and Mèo Vạc. This 20 kilometre stretch of road gently descends as it hugs the side of sheer limestone cliffs. The landscape looks positively alien, with bulbous egg-shaped boulders towering into the sky and crops ambitiously planted among a sea of jagged rocks. 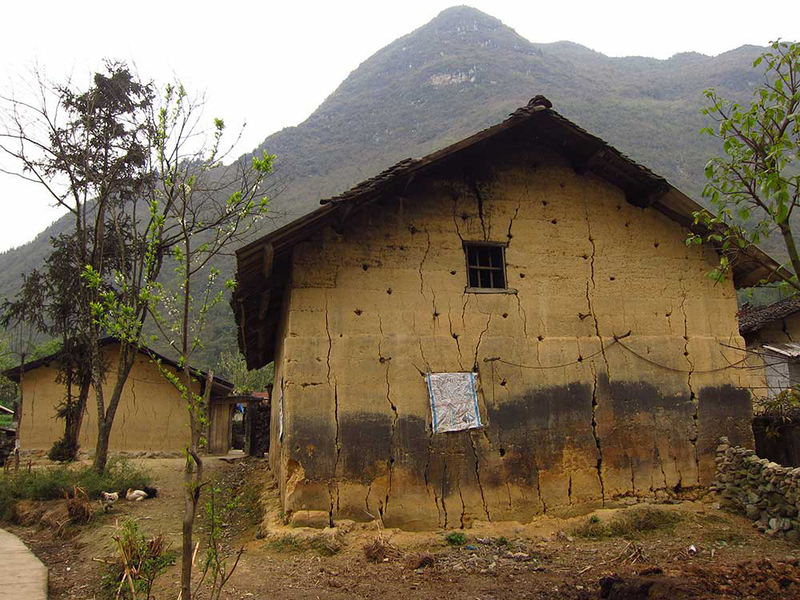 Houses made of stone look as though they were formed by simply falling from the surrounding cliffs, and hill tribe people walk along narrow ridges with hoes perched over their shoulders, laughing through gold teeth with babies slung on their backs. We pulled up alongside a motorbiking German couple who had stopped, presumably, to admire the view. 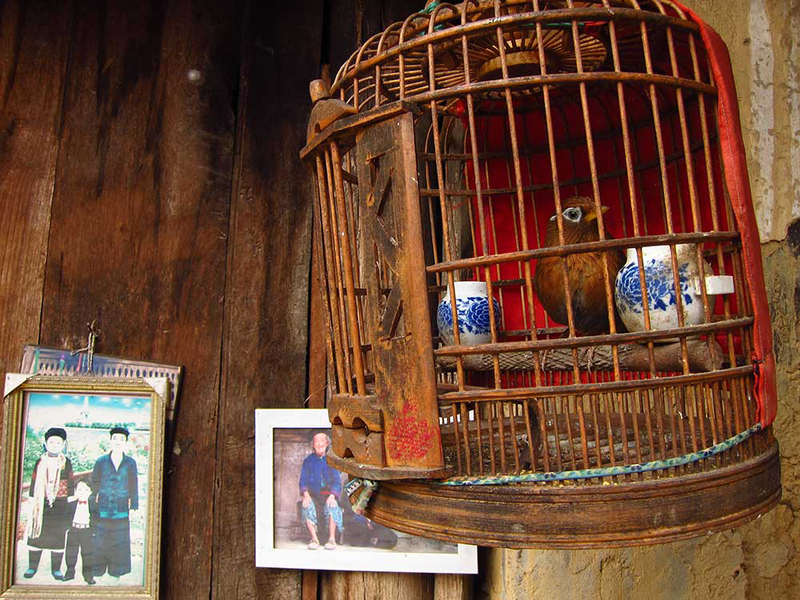 We shared stories and they asked us what the must-see places were in Vietnam since they were heading south next. We told them that was a difficult question to answer, and then they started telling us about the immigration problems of Europe. 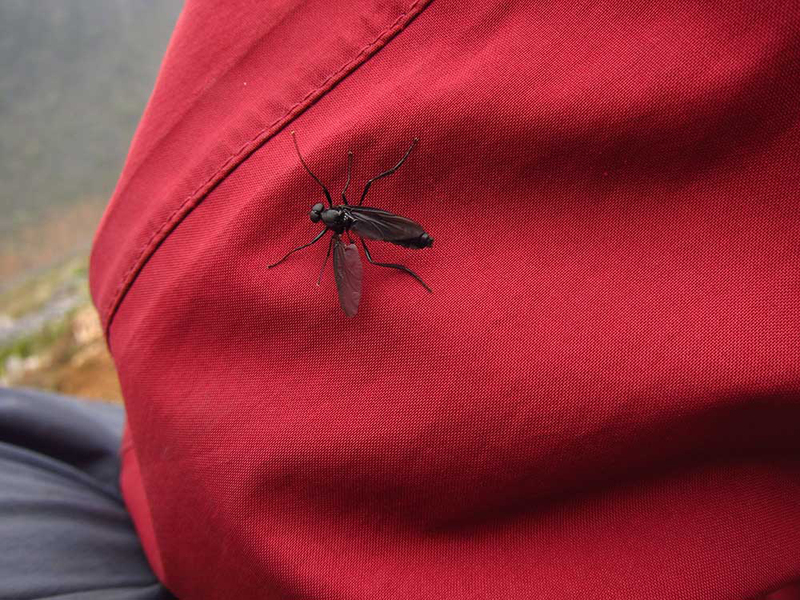 I faded in and out of concentration as they spoke about the influx of immigrants causing problems in Germany, instead playing around with the many soldier flies that kept landing on my fingers. 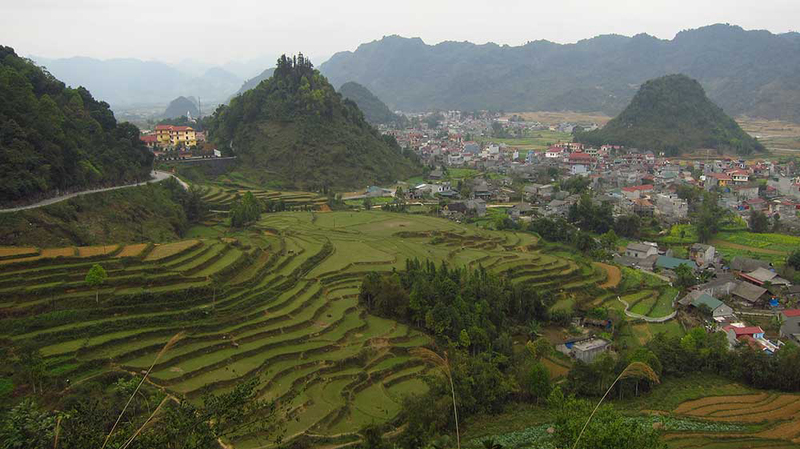 We spent an uneventful night in Mèo Vạc, then promptly left the Ha Giang region. 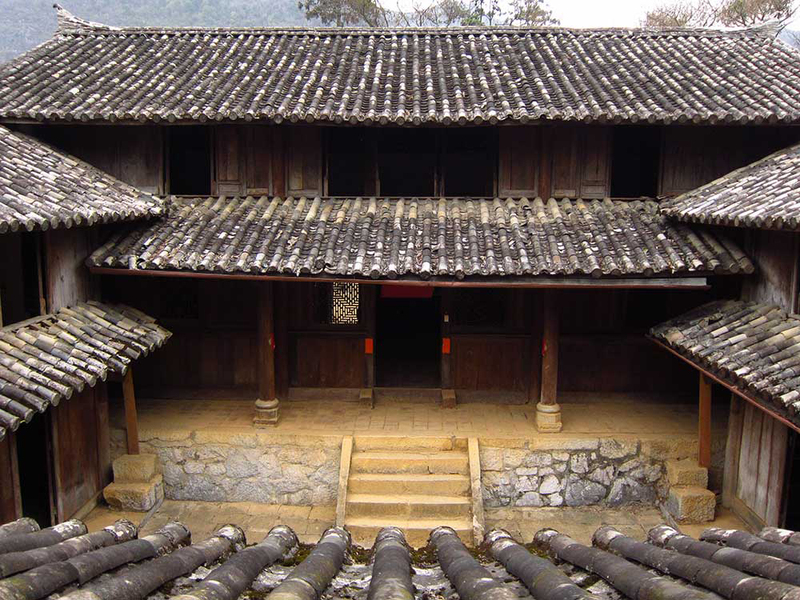 If we so chose, we could have looped around to the west and joined up again with Ha Giang city, but our ambitious time-sensitive plan pulled us east. If we’re in a film, then I think that the last couple of days have been the 2nd act in which the protagonists are facing ever difficult situations. In our case, the drives have been long, filled with craters, and teeming with slow trucks. It’s dusty when it isn’t raining and muddy when it is. 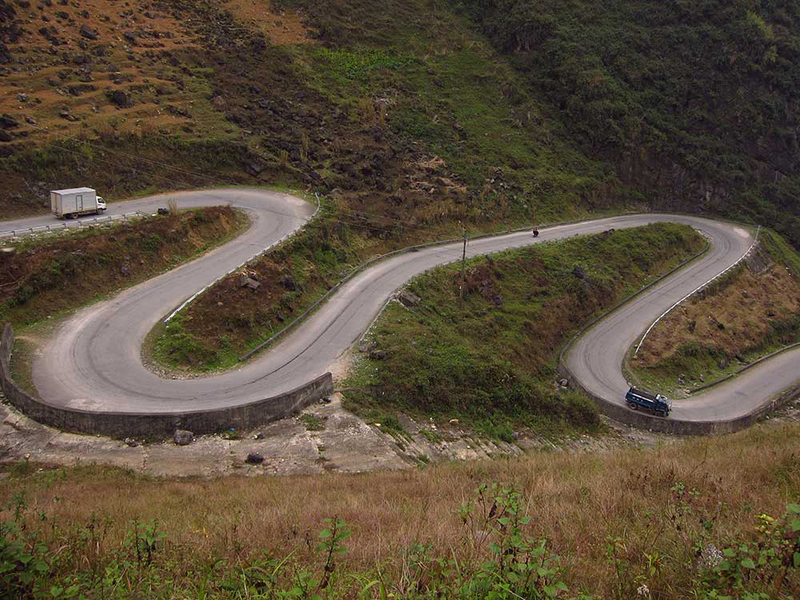 We’ve got three more days of driving before reaching Hanoi, then the bike will be sold. And even though these last few days have been hard, it will be sad to say goodbye. It’s taken us almost 10,000 kilometres! Always good to hear you guys are still going. Thanks for the vicarious travel and food. Always great to hear from you too! And you are very welcome.